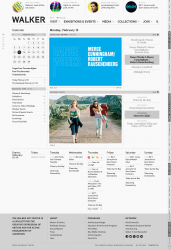 On December 1, 2011, the Walker Art Center launched its new website, an online hub for ideas about contemporary art and culture both inside the Walker and beyond. The intent of the new site is to make visible our role as a generative producer and purveyor of content and broadcast our voice in the landscape of contemporary culture. Resembling an online art magazine/newspaper in its design and format, this new site provides a multifaceted publishing platform—unique among museums worldwide. Here you will find news and feature content about contemporary art as well as the Walker’s own programs and collections. As a pioneer in developing new platforms for scholarship, publishing, arts journalism, and creative exchange with our audiences, we believe we can play an important role in offering alternative media infrastructures as arts coverage in the mainstream media outlets everywhere have been dramatically reduced in recent years. Our cross-disciplinary focus as an institution also positions us well to survey larger trends in contemporary visual arts, performing arts, design, and media culture. The Walker’s innovation lies in the site’s conceptual framework and adoption of a content-based marketing approach. As the centerpiece in the Walker’s online publishing platform, the new site is based on the belief that content should be fungible and channel-neutral. 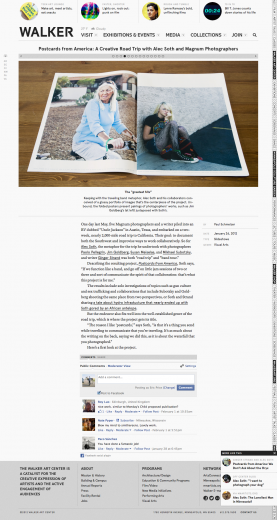 Lead by a new site editor responsible for original home page stories and curating “Art News from Elsewhere,” the Walker is leveraging content across traditional media silos to fulfill a larger vision of integrated communications, synchronizing messaging between different communication channels. Django 1.3 with a few patches, Python 2.7. Nginx serving static content and proxying dynamic stuff to Gunicorn (Python WSGI).